In describing leaves, we say they are simple, when undivided, like the leaf of a chestnut, or compound when divided into separate leaflets. The leaf of clover is compound, and may further be spoken of as trifoliate. A horsechestnut leaf is compound, and, being composed of five spreading leaflets, springing from one point is a digitate (finger) leaf. A pinnate leaf is one like the ash or locust trees. The outlines of leaves are smooth, or serrate (like the teeth of a saw), wavy, incised, dentate, words that are in common use. 1 Compound, Pinnate; 2. Digitate; 3. Lanceolate; 4. Oblong; 5. Hshaped; 6. Arrow shaped. 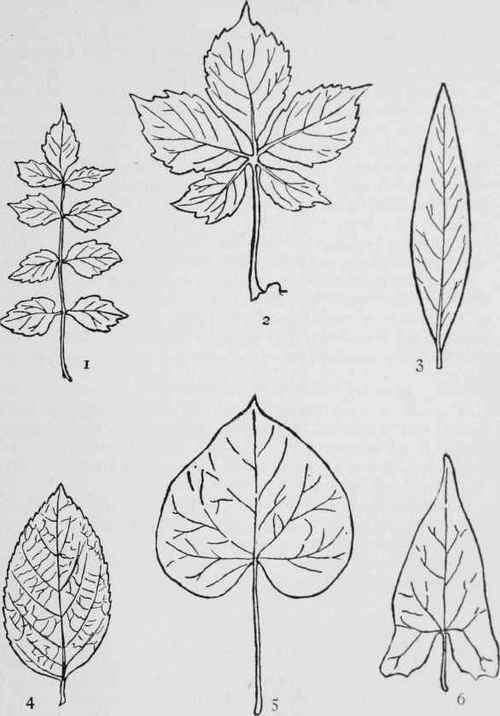 The veinings of leaves are of two kinds, parallel and net. Grass leaves, also tulip and iris leaves, are parallel, the veins running from base to tip of leaf in nearly parallel lines. Net-veins run from one or more prominent midribs to all parts of the leaf, branching irregularly, interlacing with one another, making meshes like those of a fish-net. The veins of a leaf are its frame, its supporting skeleton. A leaf-stalk is called a petiole. Leaves which are joined to the main stem without any stalk of their own are said to be sessile, a word meaning sitting. Stipules are leafy appendages found at the bases of some leaf-stalks, large and leaf-like or small and scale-like.